Command mighty Exosuits, traverse Time Rifts and lead your Path through a cataclysmic future in this epic board game for 1-4 players. Includes the base game, the Doomsday module and the Chronobot solo variant. The city of Magoria has not always been a place of magic and mystery. Decades ago, it was just another ordinary trade center loaded with shameless courtesans and greedy merchants longing for more and more wealth and prosperity. But, as we have already learned from history, a single man's will, if strong enough can change the world. It wasn't different with Magoria either; it only took one person, with immense talent and ambition, to change things forever. A talented young boy inspired by the enigmatic world of illusion tried his luck on the street with his revolutionary acts of magic. It didn't take long for people to take notice, and within weeks, he was already considered to be a genius by the public. The acts of even the greatest illusionists of the time seemed shallow and mediocre compared to his talent. In less than a year, the youngster became one of the greatest magicians of his time, a true legend of illusion who became known as Dahlgaard the Magnificent. 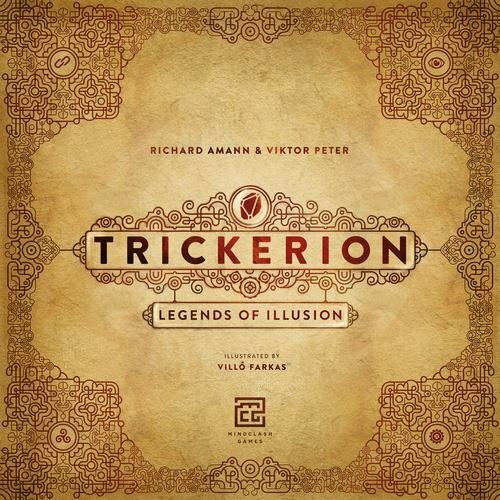 Trickerion - Legends of Illusion is a competitive Euro-style strategy game set in a fictional city inspired by the late 19th century urban life and culture, where players take on the role of rival stage illusionists. Players strive to become the city's greatest Magician by acquiring the most Fame points. But there is much more at stake than prestige alone. The audience's favourite wins the contest for the mighty Trickerion Stone, a relic that grants supernatural powers to its owner, making him a true Legend of Illusion. 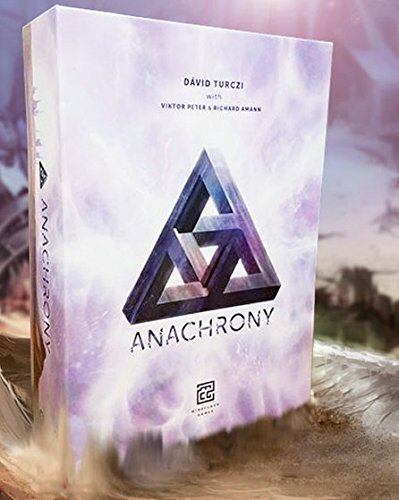 Anachrony features a unique two-tiered worker placement system. To travel to the Capital or venture out to the devastated areas for resources, players need not only various Specialists (Engineers, Scientists, Administrators, and Geniuses) but also Exosuits to protect and enhance them — and both are in short supply. The game is played in 4-7 turns, depending on the time when the looming cataclysm occurs (unless, of course, it is averted!). The elapsed turns are measured on a dynamic Timeline. By powering up the Time Rifts, players can reach back to earlier turns to supply their past "self" with resources. Each Path has a vastly different objective that rewards it with a massive amount of Victory Points when achieved. The Paths' settlements will survive the impact, but the Capital will not. Whichever Path manages to collect most points will be the new seat for the Capital, thus the most important force left on the planet... As stretch goals to the Kickstarter campaign, four Leader Boxes were available as expansions to the base game. Each Leader box contained everything from the Follower box, plus the Pioneers of New Earth module, the Exosuit miniatures -- all in an exclusive box sleeve based on a chosen Path affiliation. The four Path affiliations were: Path of Dominance, Path of Progress, Path of Salvation, and Path of Harmony.